Activity center: A public or private facility that acts as a trip generator. Accessible Pedestrian Signal (APS): Devices that communicate information about the WALK and DON’T WALK intervals at signalized intersections in non-visual formats to pedestrians who are blind or have low vision. Bicycle (Bike): A device propelled solely by human power having two or more wheels in tandem, including children’s bicycles, except a toy vehicle intended for use by young children such as a tricycle. Bicycle Boulevard: A street segment (or series of contiguous street segments) that has been modified to accommodate through bicycle traffic but discourage through motor traffic. Bicycle (Bike) Box: A defined and/or colored area at a signalized intersection provided for bicyclists to pull in front of waiting traffic. The box is intended to reduce car-bike conflicts, particularly involving right-turning movements across the path of a bicyclist, and to increase bicyclist visibility. 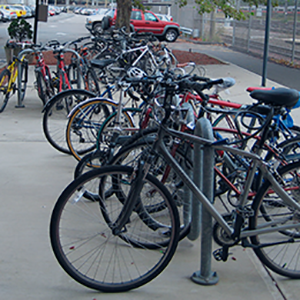 Bicycle Facility: A general term denoting infrastructure and provisions to accommodate or encourage bicycling, including parking and storage facilities and shared roadways specifically designated for bicycle use. Bicycle (Bike) Lane: A portion of a roadway that has been designated by striping, pavement markings, and signs for the preferential or exclusive use of bicyclists. Bicycle (Bike) Path: A pathway that is intended for the exclusive use by bicyclists, where a separate, parallel path is provided for pedestrians and other wheeled users. 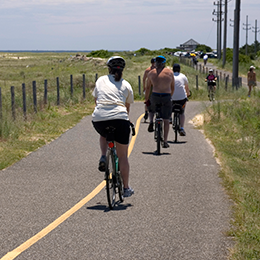 Most pathways are shared between bicyclists and other uses (See Shared Use Path). Bikeway: A generic term for any road, street, path, or traveled way that is in some manner specifically or legally designated for bicycle travel, regardless of whether such facilities are designated for the exclusive use of bicycles or are to be shared with other transportation modes. Bollards: Wood or metal posts put in the middle of pedestrian/bike paths to restrict access of motor vehicles. Bus/Bikeway: A marked lane for exclusive use by buses and cyclists. May also be referred to as a bus/bicycle lane. Complete Streets: Roadways that are designed with the safety of all users in mind, including but not limited to motorists, pedestrians, bicyclists, and transit users. Contraflow Bicycle Lane: A bicycle lane that allows bicyclists to travel the opposite direction of motor vehicle traffic on a one-way street. 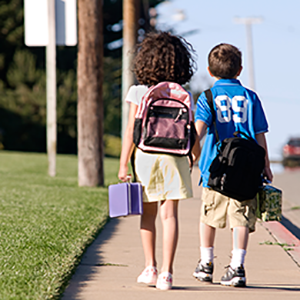 Curb Extension: A section of sidewalk or a landscaped area extending into the roadway at an intersection or mid-block crossing that reduces the crossing distance for pedestrians and may help reduce traffic speeds. Curb Ramp: A combined ramp and landing to accomplish a change in level at a curb. This element provides street and sidewalk access to pedestrians using wheelchairs, strollers or other devices with wheels. Cycle Track: A bicycle facility, typically unidirectional, that is separated from motor vehicle travel lanes, as well as sidewalks and pedestrians, by a physical barrier such as on-street parking or a curb, or is grade-separated. Cyclist (Bicyclist, Rider or Bike Rider): A person who is riding a bicycle as defined above. Detectable Warning: Standardized surface feature built in, or applied to, walking surfaces or other elements to warn pedestrians with vision impairments of hazards on a sidewalk and or loading platform, such as the curb line or drop-off. Detectable warnings are also called truncated domes. Grade-Separated Crossing: A facility, such as an overpass, underpass, skywalk, or tunnel, that allows pedestrians and motor vehicles to cross each other at different levels. Highway: The entire width between the right-of-way open to the use of the public for purposes of vehicular travel, including paved shoulders. Loop Detector: An inductive (wire) loop embedded in the pavement that detects the presence of a vehicle at a signalized intersection to activate a signal change. Diagonal quadruple loops typically provide the best bicycle detection. Multi Use Path: See Shared Use Path. National Bike Routes: A national network of bike routes that may span multiple States or have national or regional significance. On-road Accommodation: A facility that is part of the roadway or traveled way that is typically used by bicyclists and/or motor vehicles such as a shared lane, wide curb lane, bicycle lane, or bikeable shoulder. Off-road Accommodation: A path that is separate from the roadway used by motor vehicles. This may parallel a roadway or may be separate from a road, as it may pass through parks within the public right-of-way or on private right-of-way. This can be separated from pedestrian traffic (bicycle path) or shared with pedestrian traffic (shared use path). Path: A non-descriptive general term referring to a bicycle only facility but with no standardized definition. Use of the term should generally be avoided as it may refer to a range of facilities. Paved Shoulder: The portion of the roadway contiguous with the traveled way for accommodation of stopped vehicles, for emergency use, and for lateral support of sub-base, base, and surface courses. Use by cyclists may be allowed or prohibited based upon specific State laws. Pedestrian: A person on foot or in a wheelchair. Pedestrian Hybrid Beacon (PHB): The pedestrian hybrid beacon (also known as the High-intensity Activated crossWALK, or HAWK) is a pedestrian-activated device used to warn and control traffic at a non-signalized location to assist pedestrians in crossing at a marked crosswalk. The beacon head consists of two red lenses above a single yellow lens. The beacon head is “dark” until the pedestrian desires to cross the street and the device is activated. Rectangular Rapid Flashing Beacon (RRFB): A user-actuated amber LED beacon that supplement warning signs at non-signalized intersections or mid-block crosswalks. They are activated by pedestrians manually by a push button or passively by a pedestrian detection system. RRFBs use an irregular flash pattern that is similar to emergency flashers on police vehicles. Separated Bicycle Facility: A bikeway within or adjacent to the roadway and separated from moving traffic by barriers or curbs, parking lanes, striped buffers, and other means. (13) Separated bicycle facilities may be unidirectional or bidirectional. Shared Lane: A lane of a traveled way that is open to bicycle travel and motor vehicle use. Narrow Lane: A travel lane less than 14 feet in width, which therefore does not allow bicyclists and motorists to travel side-by-side within the same traffic lane and maintain a safe separation distance. Wide Curb Lane: A travel lane at least 14 feet wide, adjacent to a curb, which allows bicyclists and motorists to travel side-by-side within the same traffic lane. Shared Lane Marking (SLM or “Sharrow”): A pavement marking symbol that assists bicyclists with lateral positioning in lanes that are too narrow for a motor vehicle and a bicycle to travel side-by-side within the same traffic lane. Shared Roadway: A roadway that is open to and legally permits both bicycle and motor vehicle travel; any existing street where bicycles are not prohibited. Sight Distance: A measurement of the user’s visibility, unobstructed by objects, along the normal travel path to the furthest point of the roadway surface. Signed Shared Roadway (Signed Bike Route): A shared roadway that has been designated by signing as a preferred route for bicycle use. Traffic Calming: A way to design or retrofit streets to encourage slower and more uniform vehicle speeds. Trail: Non-descriptive general term typically referring to off-roadway facilities but with no standardized definition. Use should generally be avoided as it may refer to a range of facilities, including a coarse, unpaved hiking/biking route or a paved urbanized facility.